HomeSomewhere behind hundred mountains and hundred sea. Recently, Denis.tw created an official Tanktastic article on the Russian wikipedia. Here's a link. There's quite a bit of information about the game we haven't seen yet, as well as confirmation that the 2.0 update is using Unity 5. Note: Use the Chrome browser to translate the page. I updated the Tanktastic Wiki History page to this new information. Completely redone bullet animations, realistic exhaust, realistic smoke effects and explosion effects.thanks for valueable infomation. whoops, i have a question? 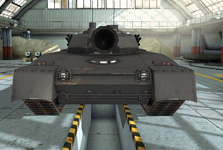 can tanks be sold? You won't be able to sell your tanks, but only upgrades, in the next version of the game. so can u actually "sell" ur upgrades? or just disable them? You shall be able to "Downgrade"
You'll be able to "downgrade" your upgrades, just like Basmal121 said. oh thats good to downgrad are upgrade for requrment..
We aren't sure whether the removal of upgrades is simply just a "switch out" thing, or they would be sold and have to be repurchased in order to be obtained again. We are not sure if we will even get a refund if the removal of upgrades is through selling, either. let but it will b gud option to downgrade or upgrade def it will downgrad free and reupgrade will mybe cost..let see when they will give us update..my eyes are tired for update.